The world lost a great actor in 2009 with the passing of David Carradine. Known by most from the TV series Kung Fu, Carradine was in pretty much every type of film out there over his 40+ year career. My favorites were definitely his work with Roger Corman in the 70s (Death Race 2000 especially). In American Reel (recently released on DVD by MVD), Carradine plays the role of a singer/songwriter, a role he had played before in Bound for Glory (in which he played Woody Guthrie), only this time he wrote his own songs. 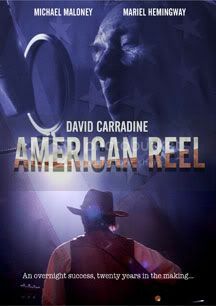 American Reel is the story of a singer named James Lee Springer (Carradine). Springer had a chance at fame and fortune many years ago but blew it because of his refusal to sell out. Now, Springer gets another chance with a song he wrote many years ago inexplicably finding its way to the top of the charts. Without a full length record to sell and the refusal to make music videos, it seems like history may repeat itself. Along for the ride are Springer's long time manager (Michael Maloney) and comedienne/personal assistant (Mariel Hemingway). American Reel is fortunate to have a story that is original. It's not often that we get to see the story of how someone became famous late in their career. Some of the situations Carradine's character is put into (making a credit card commercial) are a little ridiculous but he does his best to make it work. The supporting cast are ok but some of the dialogue isn't very well written (or acted). Carradine's songs are decent folk rock numbers and you can tell he has been playing music for a long time. Overall the film was a mixed bag that I wouldn't recommend to everyone but definitely would to Carradine fans even just to hear the man's heart poured out over his music.